It has long been my wish to visit Sravasti Abbey. The opportunity came for me to be able to make a trip there this October 2009. It was a long ride from Singapore, approximately 18 hours, but it was well worth it. I am grateful to Venerable Chodron and the community at the Abbey for making me feel welcomed and being a part of their activities for the entire month. I was blessed to be able to stay in Gotami House, which was recently completed. I rejoice at the Abbey’s success and growth and enjoy seeing Singapore donors’ names, along with all the others, on the wall of Gotami House. Long-term retreatants and guests will have no worries visiting, as Gotami House is well-fitted with all the appropriate modern amenities for a comfortable stay. There are also enough blankets for those who need lots of warmth. There is always a generous contribution of food towards the Sangha community at the Abbey, and so we were always well-fed. The daily schedule at the Abbey engages one constantly in Dharma activities of the body, speech and mind, which is most helpful for those of us who need such motivation. Venerable Chodron gives a daily dosage of Dharma teaching before lunchtime, and we always recite our prayers before and after breakfast and lunch. The Abbey’s Sangha also has a meaningful prayer dedication for those who make food offerings. This act really inspires and motivates one to rejoice and continue in the generosity. The quiet and solitary atmosphere in the Abbey is suitable and conducive for practitioners. Here, everything is given by kind sponsors, and therefore, great care is taken not to waste anything. Due to the environmentally friendly Abbey, wild turkeys and squirrels roam around freely. 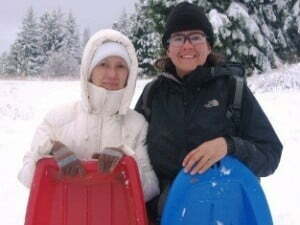 Venerable Jampel and Tsundru were kind enough to spur me on to go outside to ride on the sled. It was my first time trying it out. It did jolt me quite a bit, which brought out some laughter which was well worth it. It is really nice making people laugh. I also had a good walk with Rachel and Tsundru trekking in the snow, making foot-prints along the path. I think it is great for walking meditation. The view beyond the trees was incredible…it takes my breath away. Looking far into the great space in the horizon brings great serenity. I enjoyed the lovely view of the rising sun when we were having our breakfast. Whenever I was at the breakfast table typing on the computer, I would never fail to look out into the far horizon and find incredible peace. The Abbey and its community is blessed to have Venerable Chodron guide them in their practices and teach them the appropriate spiritual path to Enlightenment. I can feel the great love and compassion that Venerable Chodron has for her community and her steadfast commitment to help support them in every way she can. It is a joy to see that there is constant laughter all around and genuine care amongst the community. It is most important to keep up this genuine love for a long, long time and may this energy spread far and wide in the ten directions. 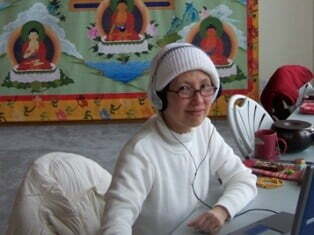 It is obvious to see that Venerable Chodron has great responsibilities to continuously inspire and motivate her Sangha community and upkeeping the Abbey to support their spiritual practices and growth and bringing the Buddhadharma to the Western people in the USA and to the people in Asia too. It is also inspiring for me to see Venerable Chodron and her Sangha community work with “friends” in the prisons, teaching them the Buddhadharma and meditation to help them transform their minds before their death penalty. Venerable, may the Abbey remain a constant beacon for your dharmic light to shine far and wide and lead many sentient beings onto the True Path of Enlightenment! I am glad I made this trip as it has been most meaningful and has helped my mind greatly! As our human life is precious and unpredictable, I would encourage Singaporeans not to wait too long, and to find time to visit soon and do some practices there and to rejoice in your contribution to the growth of the Abbey …even if for a short time. It would be greatly beneficial for the mind and you will not regret it. Venerable Chodron, and the community of Sravasti Abbey will always remain in my heart!